The RS2 was specifically designed and developed for the racehorse transportation market. The design of the forward facing low frame concept is the first of its kind in the world. We believe that this new concept will revolutionise the 3.5 tonne horsebox market. The 2XL is our Rear facing horsebox, powered by a 130HP engine. All the doors on the 2XL are uniquely manufactured by our skilled engineers, with concealed locking mechanism and stainless steel hinges. The 2XL-5 is our Rear Facing 5 seater horsebox, powered by a 130HP engine, Manufactured using an extra long chassis, which allows extra leg room in cab area. All the doors on the 2XL-5 are uniquely manufactured by our skilled engineers, with concealed locking mechanism and stainless steel hinges. Here at Maneline Coachworks, we believe in quality through precision. Having 12 years horsebox building experience and over 20 years engineering experience, we understand that using quality materials improves safety. Also being owners and horse lovers we understand more than most the desire to keep your horse safe. 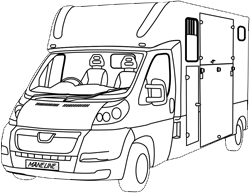 With our copyrighted forward facing long wheel base concept box and our unique design, we know that your horse will feel right at home in a Maneline horsebox. Built by a team of highly qualified and experienced engineers in rural Norfolk, we aim to provide you with the best you can buy. Our horse boxes are anti-rattle, fully type approved, and have a unique collapsible breast bar, offering the highest quality without compromising safety. Built for you and your horse.